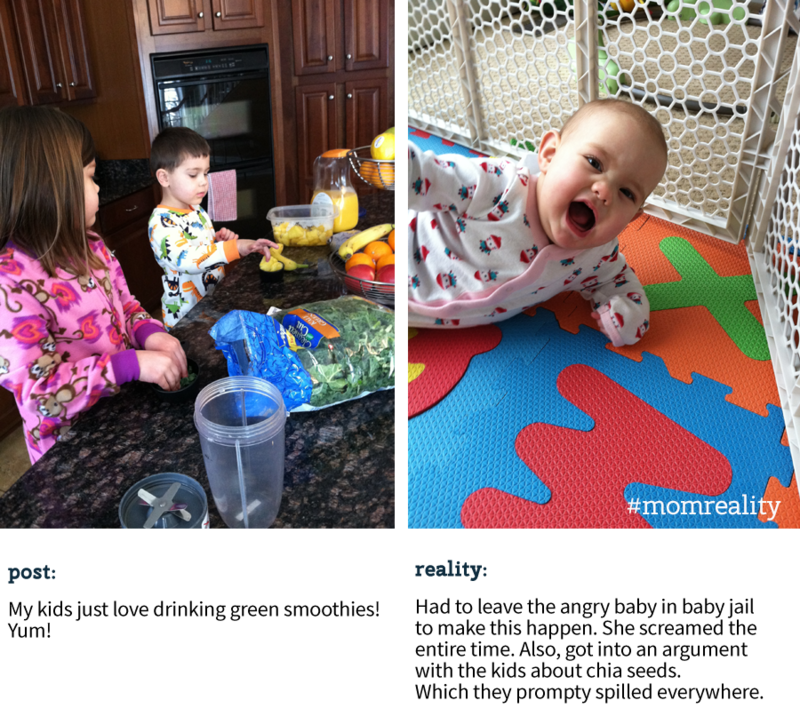 I started the #momreality movement to encourage moms to share those real life moments on social media. Messy, funny, imperfect and beautiful images. I’m very passionate about this project. I believe in being real, and celebrating how it truly can be; messes, tantrums and all. But recently, I had a very curious reaction to the project. I was asked why I hate Pinterest so much. It puzzled me. I don’t hate Pinterest at all. Without Pinterest, I wouldn’t have half as much fun party planning for my kids. 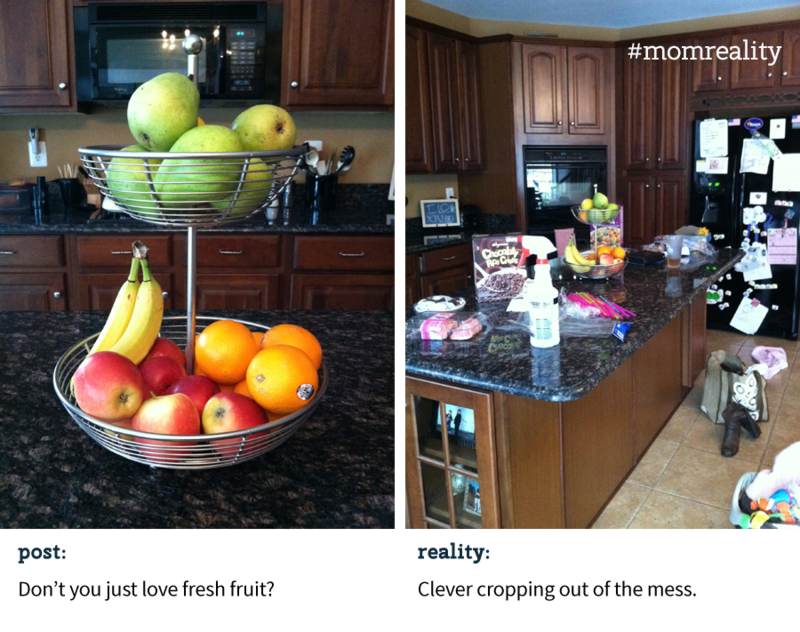 She thought #momreality was about embracing laziness, and being jealous of Moms who keep spotless houses. She thought it was about complaining about motherhood. 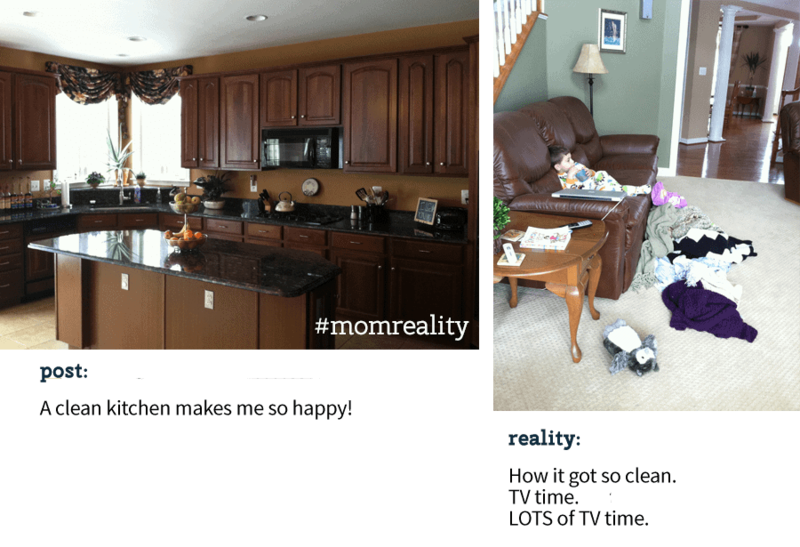 So I’m here to clarify: #momreality is…. whatever is your reality. No one is perfect, we simply each have different priorities in life. I, for example, adore Pinterest-y parties and I bake my own tiered birthday cakes for the kids, decorated in-theme. But my minivan looks like a bomb went off in it, and I’m typically behind in laundry. My toddler throws epic tantrums daily. I am not the Mom who has ever skipped a shower (it’s the only way I can wake up in the mornings), but I drink too much coffee, I play on my phone too much and struggle with disconnecting. I am getting better at keeping the clutter picked up, but I am terrible at cleaning my shower. I lose my temper with the kids way too easily. I am SO not put together. The mom with the spotless house? She has struggles, too. The same goes with the mom who lives in yoga pants. And the mom who homeschools with adorable Pinterest crafts every day. And organic food mama, and fast food mama. #Momreality is about unifying us all by not hiding the bits of motherhood that aren’t perfect. Celebrate it! Because no matter which of these Mamas you may be, you have at some point in your mothering career been brought to the brink by the small people in your house that you so fiercely love. And it’s ok. We all need to know that it’s ok.
And let’s get real… when your timehop shows you what you were up to on this day a year ago, wouldn’t you rather see what was actually going on? I’m not fooling myself. I know my staged photos are fake. They don’t mean anything to me. But the pictures of the kids having a dance party surrounded by a disaster of toys always bring a smile to my face because that’s my honest truth. The photos of my then-two-year old kicking and screaming on the floor make me smile at my now three-year-old and realize how much she’s grown and matured. I say life is crazy, but maybe it’s actually less crazy now. I wouldn’t know this if I only had pristine memories to look back on. Celebrate those real moments. Print them out! Display them with joy instead of hiding your child’s exuberance because the background of the photo is your messy living room. To help you kickstart this new line of thinking, I’m giving away a FREE small Fracture with stand over on my blog. 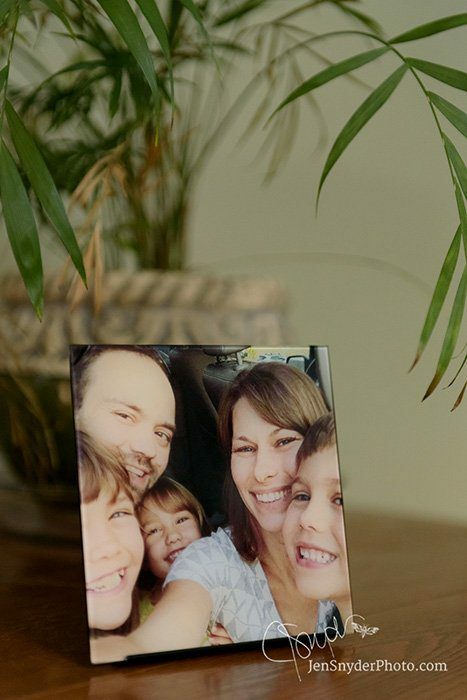 This is a gorgeous square glass print that looks beautiful on a desk or end table. Fracture takes your snapshots to the next level by printing in such a unique manor. And even better- no uploading required. They connect directly to your Instagram account! Show your reality using #momreality on Instagram, Twitter, and Facebook. Once I month, I post a handful of my favorite social media posts using the hashtag (with permission) on my blog, so come check out honest, authentic motherhood! Let’s celebrate our reality, not hide it shamefully while showcasing a world of false perfection. It’s the imperfect moments that add flavor to life, anyway. Jen Snyder’s driving passion in life is to help other moms see the unconditional love their children have for them. She is a family photographer, motherhood blogger, and rampant sci fi nerd. Based in Hardord County, MD she devotes her time to her three spirited young children, working while she can in between the dance of potty training and bus stop runs. I love this post and I totally agree, everyone has their different priorities and different strengths. No one is truly supermom or has it all together! 🙂 Love the hashtag! I’ll have to remember to use it! Call me crazy but I don’t want to see the reality. I like lookinh at clean and well organic homes as it inspire me. I love this! The reality behind my pictures always includes a screaming kid, tons of laundry and toys just out of frame. lol. I want to see reality to a point. Lol. Mostly I just want to know that other people’s kids act up and misbehave. I hate hearing all the “my kids are so wonderful” stories. I want to know about the tantrums and then I know my house is normal. Exactly! It’s so important to know we’re not alone. this post made me smile thank you for sharing at last weeks Thursday Favorite Thing party. I hope to see you sharing again this week. Pinned Hugs!